Metal carports are a fantastic way to keep your vehicles protected from the elements without breaking the bank. To have a custom garage built onto your home can cost in the neighborhood of $25,000 to $30,000. Carports can be purchased for under $1,000 depending on dimensions and add-ons. 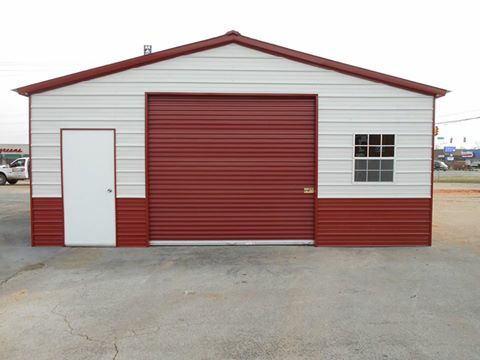 At SpringHillSheds.com, we proudly represent MaxSteel Buildings who is based right here in Tennessee. When you buy a carport from us your building won’t be from out of state and shipped in. Instead, your building will be proudly made by MaxSteel Buildings right here in the great state of Tennessee. Our carports come in three distinct styles: regular, boxed eave, and vertical. Each of the three carport styles has their own advantages. We offer buildings from 12’ x 21’ all the way on up to 40’ x 200’. We also offer the ability to have side walls ranging between 6’ high on up to 16’, depending on the width of the building. We also offer a large number of color options on our carports. We off many options including but not limited to: enclosed sides, enclosed ends, gables, garage doors, walk-in doors, windows, and many others. • All carports are built on your LEVEL area of land. If the land is not level, additional charges may apply. • Our carports are anchored down using heavy duty rebar or concrete anchors depending on the surface of the site where the carport will be installed. What is the difference between regular, boxed eave, and vertical carports? The regular roof style is our most affordable option. The side edges of the regular roof style are rounded and the panels on the roof are horizontal. The boxed eave roof style uses a standard A-Frame style roof that has 6” of overhang. The boxed eave, like the regular roof style, is also designed using horizontal panels. The vertical roof style also has a 6” overhang on the roof like the boxed eave, but the panels run vertically on the roof. The clear advantage of this roof style is that rain and snow will have a much easier time sliding off. What size concrete pad would I need? We recommend pouring concrete and additional 6” all the way around the building. Therefore, if you wanted to purchase a 20’ x 20’ building, we would suggest your concrete pad be 21’ x 21’. By doing this, you allow the concrete anchors to be installed a little farther in from the edge of the concrete. Please consult with your concrete company regarding this before you pour. What is the Metal Max warranty like? On all buildings, from the date of installation, there is a 30 day workmanship warranty as well as a 20 year limited warranty on rust through of metal panels and steel tubing assuming normal user care and maintenance. What is a “certified” building? A certified carport, or any other type of building we offer, is a building that is offers premier design and the highest quality. Certified buildings can withstand 90 – 130 mph winds as well as 20 to 30 PSF ground snow loads. If you purchase a certified building, engineer stamped drawings are available should your local municipality call for that. How do you secure the buildings to the ground? For metal structures that are install on ground or asphalt, we drive 34” rebar into the ground to secure the structure. When installing a carport, or any other type of building, onto a concrete pad we use concrete anchors. How can I pay for my metal structure? We accept personal checks, cashier’s checks, and most major credit cards. On a cash sale, 10% of the pre-tax purchase price will be due upon signing the sale contract. Again…this 10% can be paid with personal check, cashier’s check or a major credit card. The balance will be due upon completion of the structure. We also offer a convenient Rent-to-Own option on our carports for a term of either 36 months or 48 months. On the RTO option, a 10% security deposit PLUS your 1st month’s rent will be due at signing of the RTO contract. The balance would be financed and paid directly to the RTO company who have your contract with. What color options do I have on the metal? There are 14 different color options that come standard with every purchase. There are other color options that are offered for an additional fee.